Plans to build a block of luxury apartments on an historic site in Cornwall have provoked strong opposition. Talland House in St Ives was the childhood holiday home of the novelist Virginia Woolf and the view over St Ives Bay inspired her novel To The Lighthouse. On Monday, Penwith District Council planners will consider an application to build 20 flats on the property's old garden, which is now a car park. The house itself is now divided up into apartments. Vanessa Curtis from the Virginia Woolf Society of Great Britain says the view is worthy of preservation. "It's already upsetting in that what used to be the orchard of Talland House is now a public car park. "But at least at the moment you can still stand on the balconies at Talland House and see the view Virginia saw as a little girl," said Ms Curtis. "But if an apartment block is built there, then that view will be completely blocked." But the architect behind the £3m plan to build the 20 luxury apartments has defended the project. Mike Bradbury says the high number of objections does not truly reflect local opinion. "I can understand people naturally being wary of any change, it's something we find on a regular basis in St Ives," he said. 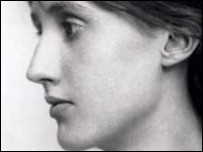 "But I think the reason we've got a lot of objections here is that the Virginia Woolf Society of Great Britain have solicited a lot of objections not just from England but all over the world." The owner of the site already holds full planning permission to build 13 flats.